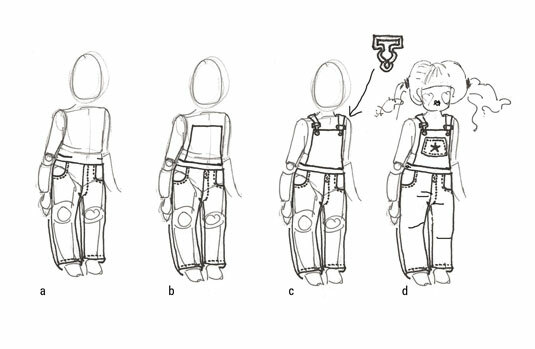 For drawing kids’ pants, almost all the same rules apply for drawing pants for men and women. The rules for women work for girls, with differences in the curves of the body; girls tend to have a boxier shape rather than a small waist and wide hips. Boys’ pants are just a shorter version of men’s pants; boys and men have the same squarish shape. For both girls and boys, the length of legs is closer to the length of the torso than on adults. You include the same details in children’s pants as you would for the adult versions, such as center front seams and topstitching, but you can go a little bolder with children’s designs. Keep in mind that children’s clothes tend to be in bright colors, so keep your markers handy! Patches: Patches are both decorative and functional and are a common part of children’s clothing. Patches are sewn, ironed, or glued on in high-wear places such as the knees, legs, and pockets. Ruffles for girls: Adding ruffles to places such as hem of shorts or pants and even to the derrière of girls’ clothing instantly says “kids”! 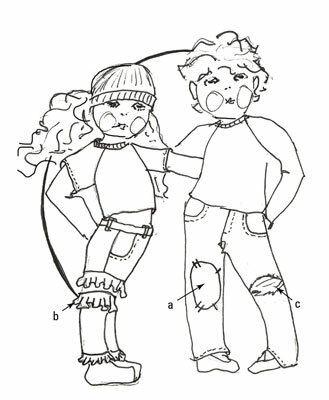 Holes in the knees: Both boys and girls tend to be hard on their clothing, especially in the knee area; therefore, you often see pants that already have holes in them as a fashion statement. Overalls are a staple in almost all toddlers’ wardrobes. The pants are durable, washable, and cute! Plus, they keep the shirt (and the kid underneath) a little cleaner than a regular pair of pants does. The great news is that drawing overalls is easy. Start by drawing a three-quarter view of a toddler. Draw a pair of jeans. Add details such as topstitching. Remember to scale down the size for a child’s body. You don’t need a button for the center fly on overalls; instead, there’s usually topstitching in a square or X shape. Most overalls don’t have a front fly. Starting at the waist, draw a trapezoid covering the chest. The size of the trapezoid, or bib, is up to you. Add straps that go over the shoulders and buckles at the top corners of the bib. Buckles can be a tough feature to draw. Finish with a pocket on the front bib and a button on the waistband above the side pocket. Add a kid-friendly design on the front of the pocket or draw something peeking out of the pocket — maybe a frog or a half-eaten candy bar.